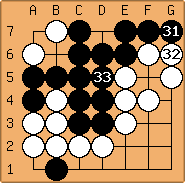 I played White in this game, giving a 2 stone handicap to the black player. Especially against true beginners, I think it's very easy to overwhelm with advice. So I pointed out the losing move, and where it would be better played. What do you think? After / , black can't win. 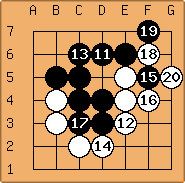 If had been played at , black had an easy game. There were other mistakes, both before and after, but that's the key split/connect that makes the game. Of course is a losing move, and thus a fine example for this page. It is the first bad move. There's a lot of things to tell about the empty triangle. The empty triangle can easily occur in other games. The cut at is too specific, just for this game. There only a few stones on the board. 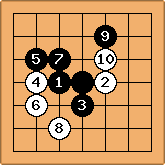 True beginners can be overwhelmed by too many stones on the board. So I think the Losing Move isn't necessary the move to discuss to help beginners getting stronger.